Napoleon's Last Gamble: Expasion Kit II - The Road to Hal. 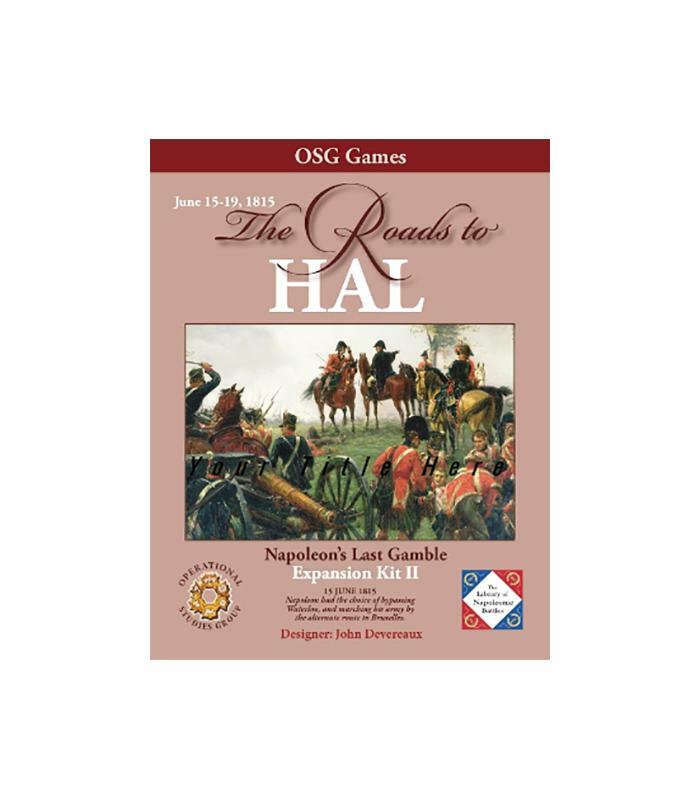 Note: this Expansion Kit requires the use of the game equipment from OSG’s Napoleon’s Last Gamble and previous Expansion Kit I. It provides a Map extending from West of Bruxelles to beyond of Hal to give players more room to manouvre and to check Wellington's Reserve Units (which had been provided in NLG as Alternate reinforcements) in action. 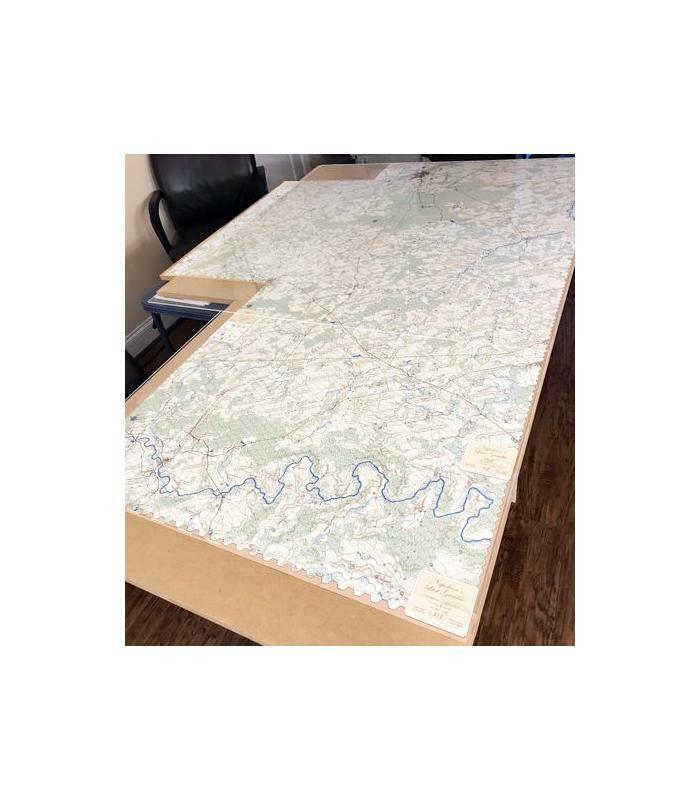 This Kit includes new Anglo-Allied setup and arrival information for the WX Map. The French and Prussian Scenario set up and arrival information is unchanged (except as noted). No new Counters are required. 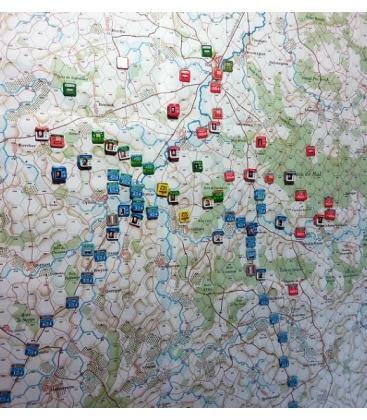 38.0 The Waterloo Campaing - Three Approaches to Brussels, 15-19 June 1815. On June 14th, Napoleon has concentrated his Forces between Maubeuge and Beaumont and must decide whether to move directly on Brussels or shift westward through Nivelles to Hal and confront the Anglo-Allied Army at a distance from the Prussian Army. 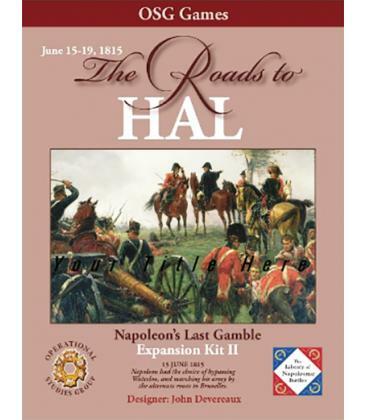 39.0 The Hal Battle - No Relief in Sight, 18 June 1815. Off the Map, Grouchy is successfully blocking the Prussian Army from joining forces with Wellington’s Army at Hal. Napoleon and Wellington’s Armies are roughly equal. Who is the better commander? 40.0 The Fields of Hal - Wellington’s Predicament, 17-18 June 1815. Wellington had prepared for Battle at Hal and would have quickly assembled his Forces in pre-planned positions. The Prussian Army would have strained every nerve to join Forces with the Anglo-Allies, facing a longer march. Can Napoleon defeat Wellington before Blücher’s arrival? 41.0 The Turned Flank - Napoleon’s Phantom Left-Hook, 18-19 June 1815. Wellington politely failed to mention that French Command issues could be fatal to any strategy. This Scenario allows the players to explore Wellington’s Turned Flank strategy while minimizing French command errors. Can Napoleon prevail? 42.0 Wellington Reinforced - The Corps from Hal (2 Variants), 18 June 1815. Historians are often dismissive of Wellington’s leaving 17,000 men at Hal. These are 2 variants for the NLG “Battle of Waterloo” (30.0) which explore the What If possibilities if these Units were better utilized. All other 30.0 Rules are in effect. 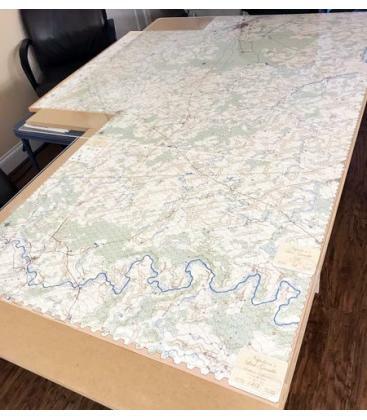 Contents: 1 Map Sheet, Hal (WX) – 22x34” , 1 Study Folder (4 Pages), 2 Initial Anglo-Allied Setup Cards, 6 Turn Record Cards and 1 Casualty Record Card.